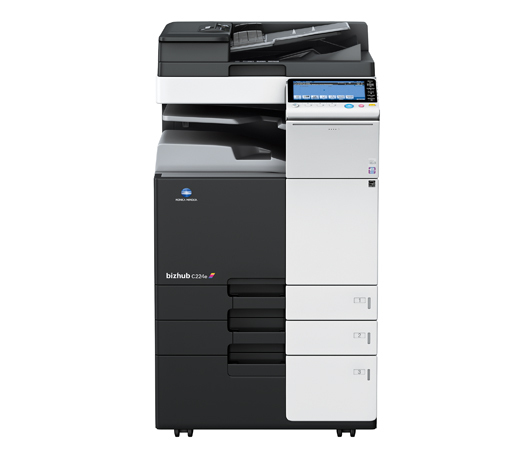 A Konica Minolta MFP is always an excellent choice for an active, busy workplace. Having one in your office will no doubt make your workflow faster. As described by Konica, with these machines, you will “do more, spend less”. The Konica Bizhub C224e is a particularly good choice. All your black and white and color copy/print jobs will be well taken care of with its wonderful output speed of 22 pages per minute. You can also enjoy optional single pass dual scanning and its super G3 fax ability, in addition to many other finishing options such as stapling, folding or saddle-stitching. So configure it just the way you need it! The 9 inch color touch panel allows you to swipe, drag and drop, tap, toggle and finger-pinch – as easy to use as a tablet PC. The high level security features of this machine will protect all your data in the best possible way. This is to name but a few of the many great functions, the Konica C224e has to offer. Are you already a proud owner of a Konica Minolta Bizhub C224e? Share with us in the comments below all about your experience with this machine.